Panda is a simple mod designed (initially) to speed up mass-disenchanting. This functionality was expanded to include prospecting, gem cutting, milling, glyphs, flasks, elixirs, and quick viewing of AuctioneerAdvanced prices. To access the panda panel use /panda or the LDB launcher. More 4.0 fixes are on their way! Why was dongle still here? I really wanted to check my glyphs and stuff in game, so I updated this for the new glyphs. I.... Think I did it properly? Never actually used github before. You'll have to manually install this over your existing panda...Note: If you use Curse, set it to ignore or it will try to replace this, almost instantly. Once you're back into WoW, use your Ampere to enable Panda, and then /panda to open your window for happy milling. IF you only see the enchanting stuff, close panda, and open your Inscription book. Now reopen Panda with your book still open. I'm not having luck with the massmill macro, but from the Panda frame you can mill every bit as quickly. It's just a bit of a screen hog. Any chance for updating Enchating tab? I really would like to see WoD enchants here like glyphs. Or anyone know fix for this? Any way to get tooltips to show up on items? Specifically my wife was wanting to check exactly what she was DE'ing before clicking. Hi! Just wanted to report that the BOA Stormwind Tabard (http://www.wowhead.com/item=118365) is showing up in the list of stuff to be de'd. Is there a date set to get inscription updated? I have 6.0.0.48 beta, and it looks simply awesome. I love how it's being broken down by xpac for all the trades represented and it will truly make it a one stop addon for our crafting. Panda will get an update. It's not broken so there isn't a huge rush, and adding new panels for new expansion tradeskills is a slow, manual process. tl;dr: check "enable outdated addons" and you'll probably be fine for now. for some reason panda is on his unable to access list. Could you work things out with him so Panda can finally be gloriously skinned in elvui? I have been using this addon for years. I love it, but with out the hope of an update I think it has outlived it's lifespan. Hopefully an "OFFICIAL" update or maybe a nice Fan update to make sure it is correct for WOD! Thanks for years of great service Pandaman! erogroth, are you using the latest version? I milled herbs of different types yesterday and had no problems with remainders. In my experience, it's a stack arrangement issue in the bags, and even not specifically a Panda problem. It happens when the "bottom stack" of millable or prospectable material is less than 5, even if overall you have plenty in other stacks. "Bottom stack" is the stack in the lowest slot in the lowest bag. In practice, it's the slot last filled by looting, if all slots were filled in order (without the user rearranging stacks). 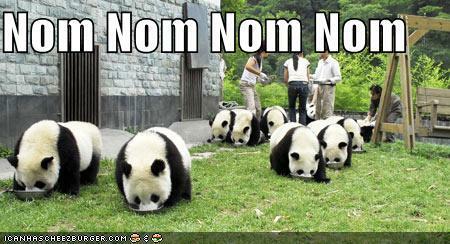 The only Panda-specific issue is that Panda doesn't try another stack if the bottom stack fails. I haven't tried to code a work-around, but as a suggestion to the devs, you could have the code check other stacks if the "selected" stack (by internal iteration) fails for being short. Last edited by gnoitall : 07-12-14 at 06:33 PM.